Posted on 28, March 2019 by EuropaWire PR Editors | This entry was posted in Business, Financial, Germany, Investment, Management, News, Technology, Telecom and tagged 5G, 5G network, Deutsche Telekom, digitalization, dividend, EBITDA, EWE, Free cash flow, FTTC, FTTH, FY 2018, Glasfaser NordWest, MERGER, mobile communications, networks, Sprint, T-Mobile US, Tim Höttges. Bookmark the permalink. BONN, 28-Mar-2019 — /EuropaWire/ — At the Deutsche Telekom‘s 2019 shareholders meeting CEO Tim Höttges boldly outlined that the company is strongly committed to sharing and participation. To accomplish this, Deutsche Telekom stays very close to its customers and is about to strengthen its subsidiaries and associates in a number of countries while investing massively in the future. Deutsche Telekom understands the participation as being connected and is heavily investing in networks – EUR 46 billion since 2014, and 21 billion out of this in Germany alone, without counting the spectrum acquisition cost. Some 33 million households in Germany have already a fiber-optic-based internet access from Deutsche Telekom (FTTC). And out of this number some 20 million households enjoy speeds of up to 250 Mbit/s. Next take for Deutsche Telekom is to to accelerate the build-out of fiber to the home (FTTH). The 5G era is here and the industry is facing a major change. Optical fiber is going to play a significant role in the the fixed network. And according to Deutsche Telekom CEO new times call for new answers. Cooperation with competitors are now a fixed component of the build-out strategy and a player with a market share of 40 percent cannot build all of the new networks, added Tim Höttges. Cooperating with rivals is also happening in the mobile communications for Deutsche Telekom where the company allows its competitors to share use of the majority of its cell sites. Deutsche Telekom builds the mast, and others can use it to mount their antennas particularly in rural areas, where coverage gaps are still large, commented further Tim Höttges. According to its CEO, Deutsche Telekom is open for discussions with mobile competitors about closing further gaps. Furthermore, Deutsche Telekom has just established a joint venture inn the fixed network with EWE where 1.5 million households in north Germany will be supplied with FTTH under the brand name Glasfaser NordWest. In the fixed network, he referred, among other things, to the establishment of the joint venture with the provider EWE, announced just a few days ago. 1.5 million households in north Germany are to be supplied with FTTH under the name Glasfaser NordWest. Commenting further, Deutsche Telekom CEO lobbies for fair and market-oriented solutions saying that maximum investment and maximum regulation just do not go together. In this regard Höttges pointed at the two years or more approval time for cell sites in Germany being way too long. Furthermore, access regulation for new fiber-optic networks is seen as counterproductive by Deutsche Telekom as it devalues investments. Tim Höttges pointed at the risk of reaching a moment where there will be no money left for the build-out for the 5G as quarter of the available spectrum is not even being auctioned while an artificial shortage of public resources is being created, which may push up the price. When it comes to customer service, Deutsche Telekom has seen the number of complaints dropping by 25 percent in 2018. Participation in this case means maintaining a dialog with the clients – either online, in the Telekom shops or via call centers. Treating customers equally is another change Höttges sees in the company. Deutsche Telekom wants to address the unequal treatment of new and existing customers where many customers are loyal to us for years while they do not get the same offers and discounts as new customers. And this is changing. Current offering is the same for everyone, loyal customers and new customers, added Höttges. Noteworthy, Deutsche Telekom plans to run its network exclusively on renewable energy from 2021. Because, digital applications help to save CO2 emissions overall, but with energy-intensive data centers, Deutsche Telekom is also “part of the problem” in climate change, according to Höttges. And it is all about listening to the the younger generation, which is already asking “Are you building or obstructing our future?” That’s why, Deutsche Telekom’s carbon footprint should be cut by 90 percent in total by 2030. Together, T-Mobile US and Sprint can build a 5G network faster. When it comes to the FY 2018, Deutsche Telekom sees a record year. The revenue for the Group has grown by 0.9 percent to 75.7 billion euros in 2018 financial year. The adjusted EBITDA has increased by 5.0 percent YoY to 23.3 billion euros while the free cash flow is up by 13.7 percent to 6.2 billion euros. 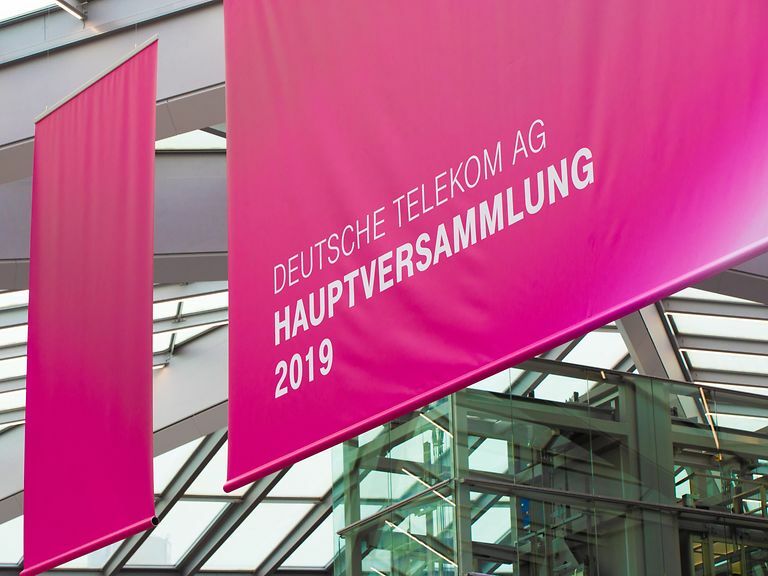 Therefore, The Supervisory Board and the Board of Management of Deutsche Telekom have proposed to the shareholders’ meeting a dividend of 70 eurocents per share. As compared to the previous year when the dividend was 65 eurocents per share, which represents dividend growth of 40 percent over the last four years. The Group’s medium-term outlook expects further growth. Until 2021, the dividend is also expected to continue increasing. However, the measure for this will not be free cash flow as hitherto. Referring to the Spring merger, if successfully taken over in the United States, there will be start-up costs. In this case, the dividend is secured at a minimum value of 50 eurocents per share.